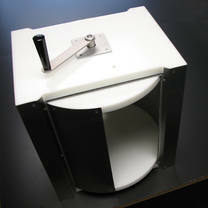 The standard size 36 x 36 inch (914 x 914 millimeter) unit includes a Rotary Server. Available with an 12 inch or 18 inch deep bullet resistant shelf which is covered with a black plastic laminate. The unit comes standard with a Level 1 Non-Ricochet Bullet Resistant Deal Tray. 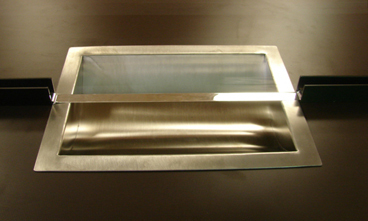 Glazing is 1-1/4 inch (32 millimeter) bullet resistant Level 1 Acrylic. Available frame finishes are satin anodized or duranodic bronze. Voice transmission is accomplished with Surround Sound. The standard unit is recommended for interior use, but exterior models and custom sizes are available on special order. exterior models and custom sizes are available on special order. 14" x 8" x 1-1/2"
16" x 8" x 1-1/2"
14" x 13" x 2-1/2"
14" x 17" x 1-3/4"